Home / Technology / Connect IPS e-payment Officially Launched, Better Than E-sewa And Khalti? Connect IPS e-payment Officially Launched, Better Than E-sewa And Khalti? Connect IPS New Payment Gateway For Nepal. Nepal Clearing House Limited (NCHL) in collaboration with Nepal Rastra Bank (NRB) have brought new e-payment gateway in Nepal namely Connect IPS. In a recent programme held at Soaltee Crowne Plaza, this new e-payment system was unveiled. 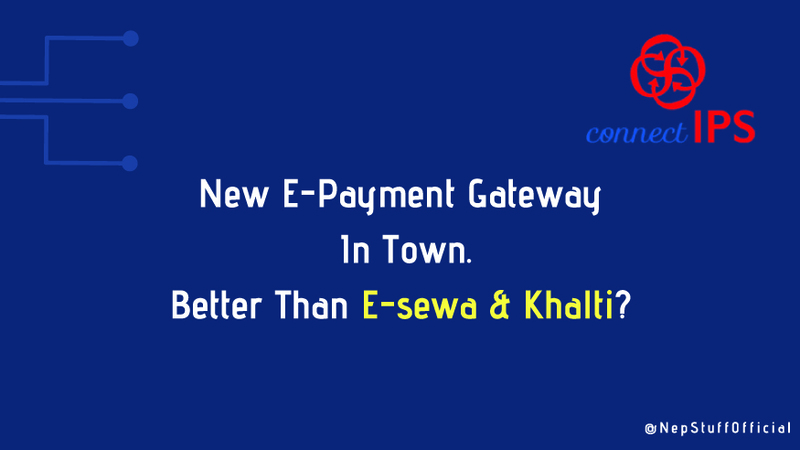 We already have two popular e-payment gateway systems for Nepal, i.e E-sewa and Khalti. These payments gateways can be used for e-payments of bills, buy tickets, topup phones and pay online in various portals. The major difference between these two gateways and ConnectIPS is that, E-sewa and Khalti are to be loaded with funds. That means one has to go to the bank or physical stores of these gateways and load his E-sewa or Khalti wallet. If one has a internet banking then he can load fund through the internet as well. These E-sewa and Khalti gateways store our money in their account, and whenever we want we can make a electronic payment or transaction. But this new e-payment gateway Connect IPS is different from these previous gateways. There is no any hassle of loading the funds to the wallet, we don't have to rush to the bank or physical stores to load our wallet. Isn't it amazing? One has to create an account in Connect IPS and add his bank account. After the one time confirmation from the bank you are set to go. When you want to pay online, your money will be deducted directly from your bank account. There's no any third party portal to store your money. There is a per transaction limit through the web and mobile app. One can perform transaction of NRS 1 lakh at atime through web whereas the per transaction limit through the mobile app is NRS 5 thousand. One can get regular online payment service as in E-sewa and Khalti, further more Connect IPS can be used to pay all kinds of governmental taxes. In simple it allows Citizen-to-Government (C2G), Customer-to-Business (C2B) and Peer-to-Peer (P2P) transactions from/to bank. Connect IPS is currently in collaboration with 44 banks and financial institutions and this number will be increasing. Signup for Connect IPS From Here. Know More By Watching This Video Tutorial. Keywords : Khalti, E-sewa, E-payment of Nepal, E-payment In Nepal. Why Follow Your Passion and leave money Behind?